Frasher Real Photo Postcard: Grapevine Station and Cafe, 1940s. 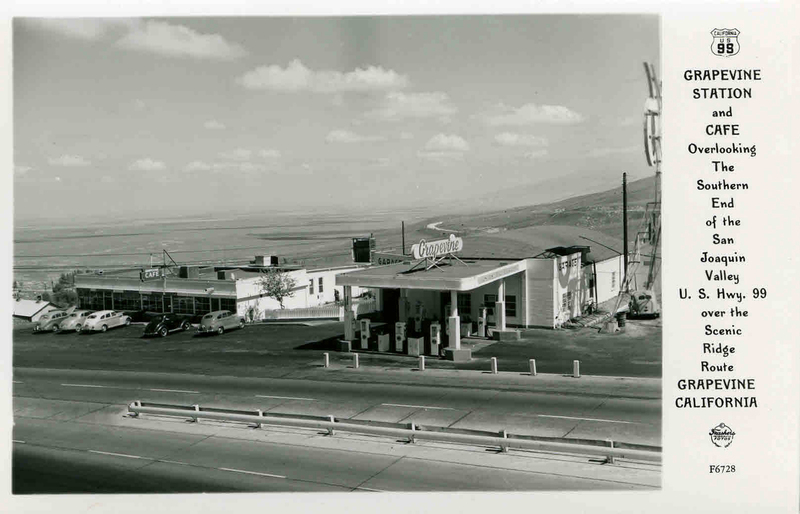 This facility was located on the northbound lanes of Highway 99 (now Interstate 5) as the road climbed the Grapevine out of the San Joaquin Valley. California, US 99. GRAPEVINE STATION and CAFE Overlooking The Southern End of the San Joaquin Valley U.S. Hwy. 99 over the Scenic Ridge Route GRAPEVINE CALIFORNIA.